A new study has found that Singapore has come in eighth for the most creative productivity in Asia Pacific region (including Japan and Korea). Earlier this year, Singapore also took number one spot as Asia’s most innovative country. Japan and Korea nabbed the first and second spot while Myanmar, Pakistan, and Cambodia, by contrast, are ranked as the least efficient innovators. Meanwhile United States and Finland have been included for comparative purposes, said the study. 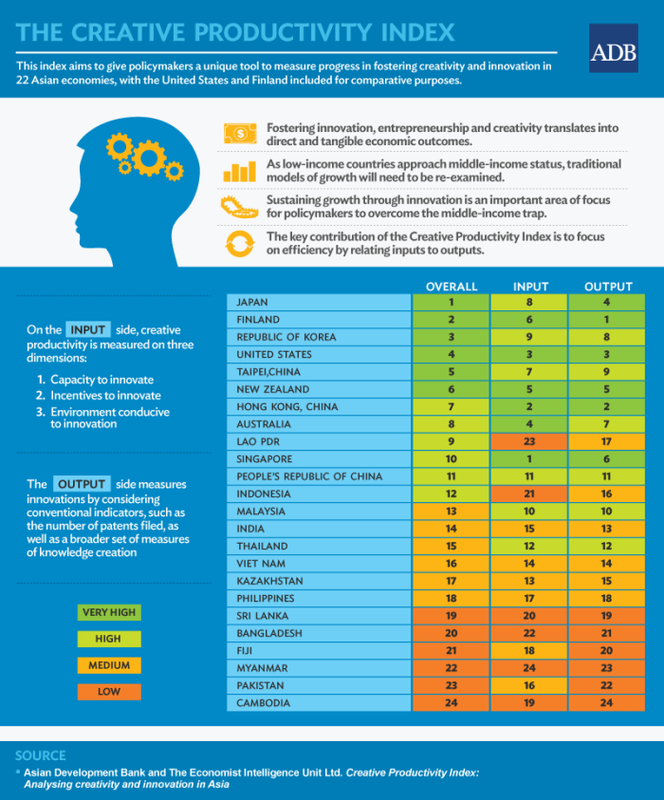 On innovation input alone, Singapore topped the rankings with strong political institutions, protection of intellectual property, and contract enforcement. Among Asian countries, Hong Kong, China topped the list in terms of innovation outputs due to a high level of export sophistication and its prolific film production industry. The survey was done by the Asian Development Bank (ADB) and Economist Intelligence Unit. The index included a total of 24 economies, with the US and Finland included for comparative purposes. It measured innovation and creative capacity of economies by relating creative input to output. “As countries seek to innovate to avoid middle-income traps, all governments—especially those with limited resources—need to be sure that their investments boost both efficiency and productivity, benefiting their economies and people, and move to a knowledge-based economy,” Bindu N. Lohani, vice-president for knowledge management and sustainable development at ADB said. The study added that creative productivity is an “important attribute for knowledge-based economic development” and while measures will differ by country, policies that make it easier to set up businesses and create flexible labor markets would result in greater investment in education, skills, information and communications technologies, and internet access. The in-app game is a collaboration of two OCBC Bank mobile developers, one experience designer and four 10-year old students. ..
A dedicated DKSH team will provide marketing, sales, distribution and logistics activities in both retail and in professional heal..
Netizens seem to get enough of Minions-related products and complain they have reached into some weird corners. The following are ..